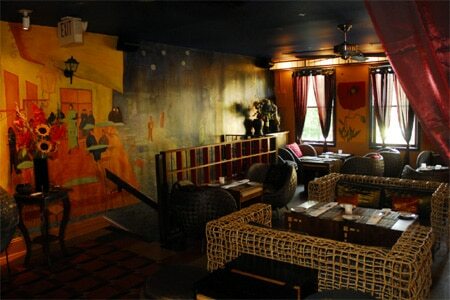 Upscale French food in a classy setting with a cozy upstairs wine bar. : This cheerful French restaurant has won the hearts of those lucky enough to live in the neighborhood. If you want to make sure that you can occupy one of the seats, either downstairs or upstairs, it's best to call in advance, for the place fills up fast with regulars. The chef has constructed a menu that is short, direct and depends on seasonal fruits and vegetables. For dinner, he prepares such interesting basics as onion tart or smoked trout salad to start and follows with salmon in a potato crust and sautéed sea scallops. At lunch, lighter fare predominates, and you may be satisfied with grilled trout or sautéed shrimp. Or really splurge on calf's liver with capers, garlic and black olives. Take advantage of the restaurant's wine collection.